Europe is filled with many countries and cultures that you can immerse yourself in while you’re there. While it may seem like a daunting and expensive trip, a European vacation doesn’t have to break the bank. By planning affordable travel and accommodations, you can easily manage your money while abroad. Once you’re there, you’ll be able to sight-see, try new foods, and meet new people on a budget! 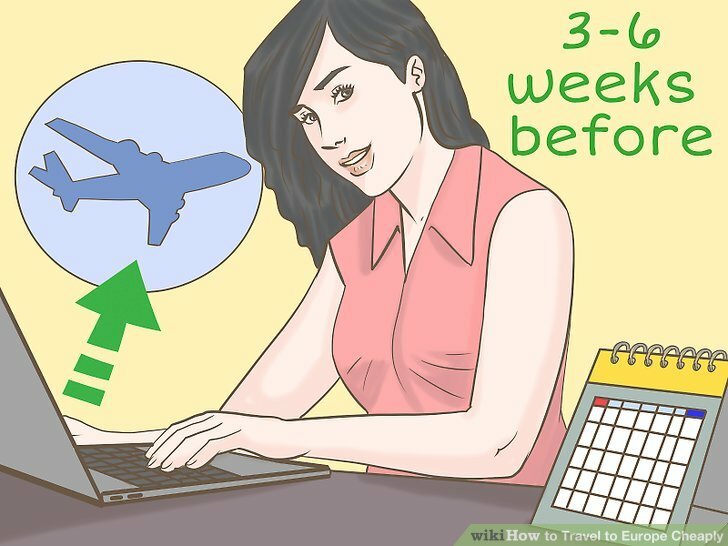 Book your flight 3-6 weeks in advance of your trip. Flight prices tend to get more expensive closer to the date that you plan on leaving. Start looking for flights about 2 months before you depart to get the lowest prices for air travel. Continue checking prices for the next few weeks to see if the price changes. Track flight prices on Google Flights to see when tickets are cheaper or more expensive. Turn on notifications for the days you plan on traveling to get alerts when prices change. 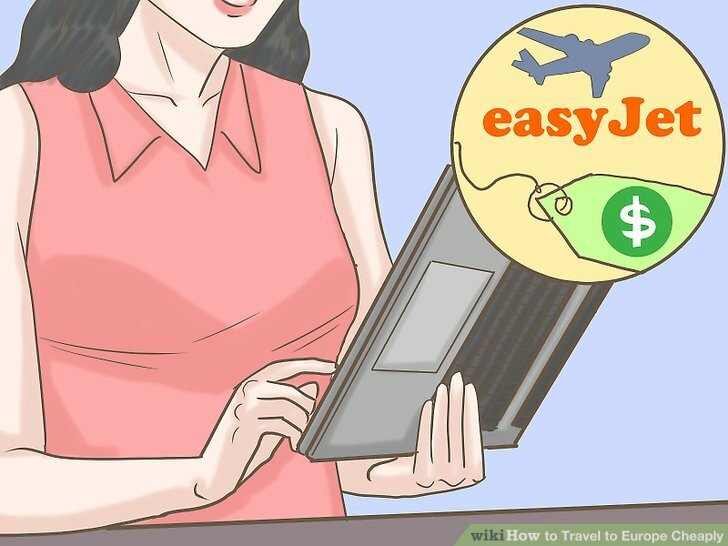 Use a low-cost airline to save money. Before reserving seats on an airline you’re familiar with, check smaller airlines for more competitive prices. Budget airlines like Primera Air, Wow Air, and Norwegian Air offer one-way flights across the Atlantic Ocean for as low as $99 USD. 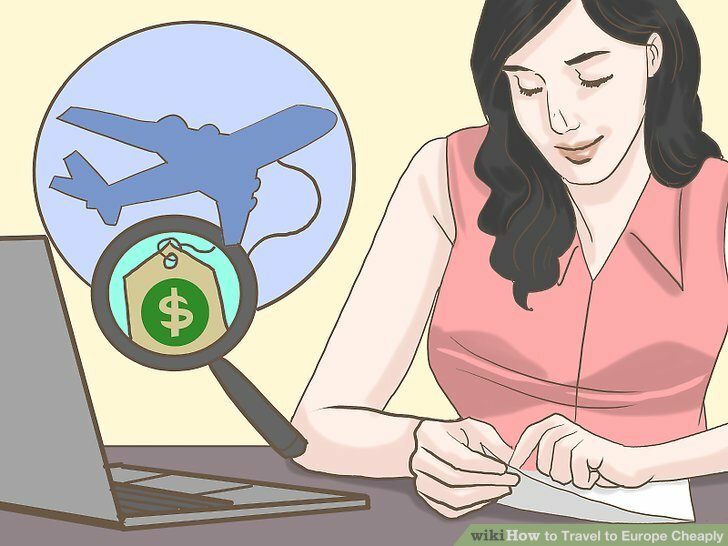 Read the airline’s terms and conditions before purchasing tickets since they may have hidden fees for items such as carry-on bags or checked luggage. In the United States, airline prices may be cheaper if you fly out of an international hub airport, such as O’Hare in Chicago, New York City, or Boston. Fly into a small city nearby if you want to travel to a popular location. Flying directly to the city you want to visit may be more expensive than a flight to somewhere nearby. 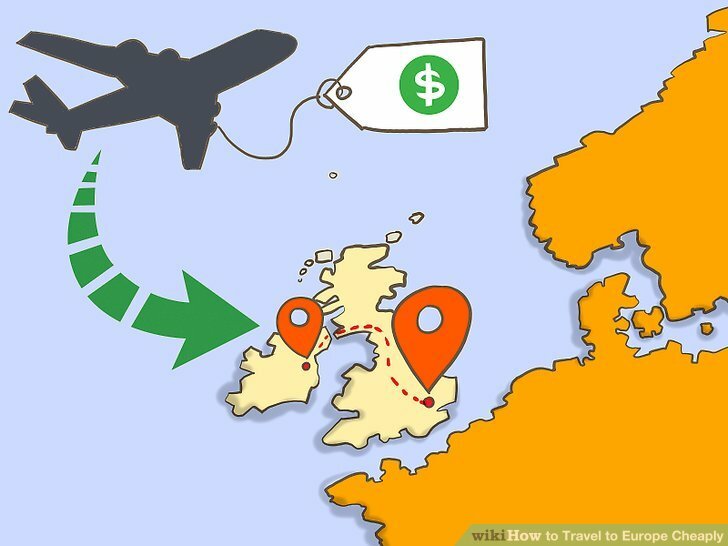 Compare prices for taking a direct flight to the area you want to visit as opposed to a smaller city in a different country. 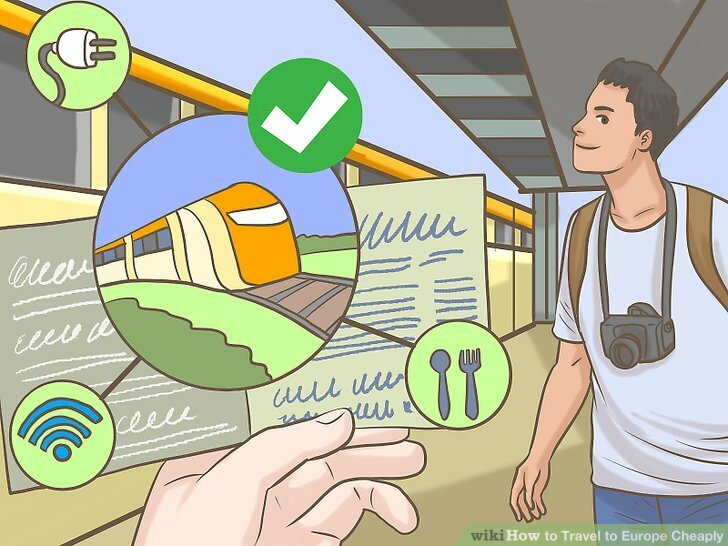 That way, you can easily travel by train or smaller airlines for much cheaper. For example, if you wanted to visit London, you may fly into Dublin instead for a cheaper flight and then travel to London from there. 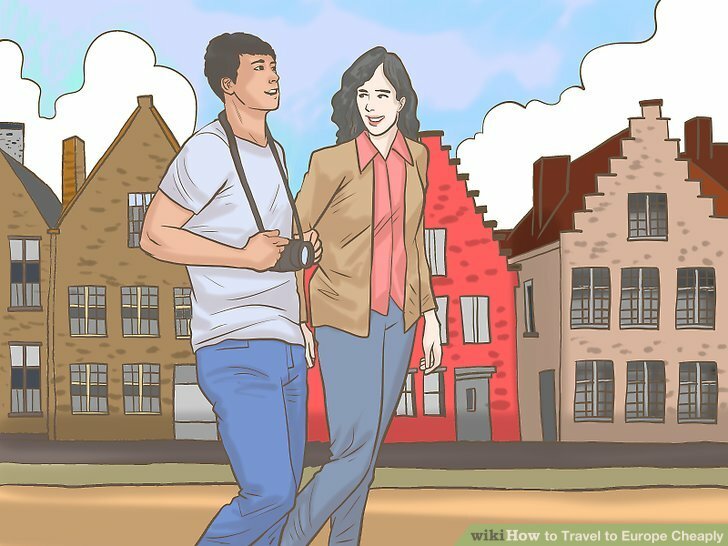 Look for hostels if you’re comfortable sharing a room. 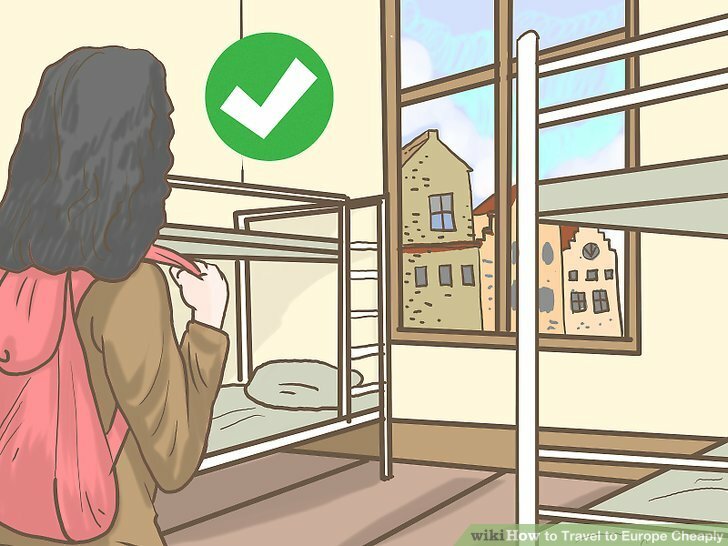 Hostels are residences where you can share a room with other people. Many hostels run at a fraction of the price of hotels so they’re more affordable for you to stay in. Plan on spending between about $20-$40 USD per night if you end up staying in a hostel. Depending on the hostel, a private room could be an option, but it may be more expensive than a shared space. Search for short-term home rentals to save money if you have a large group. 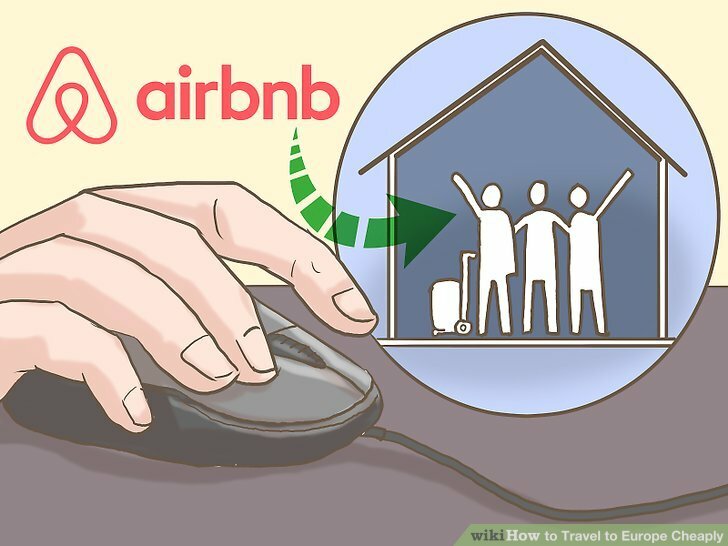 Use a rental app, such as Airbnb or Homestay, to find private homes or apartments to rent for your stay. Many homes offer cheaper accommodations per person if you have a group of 4 or more. That way, you’ll also have access to a kitchen, a private bathroom, and a comfortable place to relax when you’re done traveling for the day. Talk to your host about local restaurants to try or recommendations for what to do while you’re visiting. Use a couch-surfing website to stay with locals in the area for free. 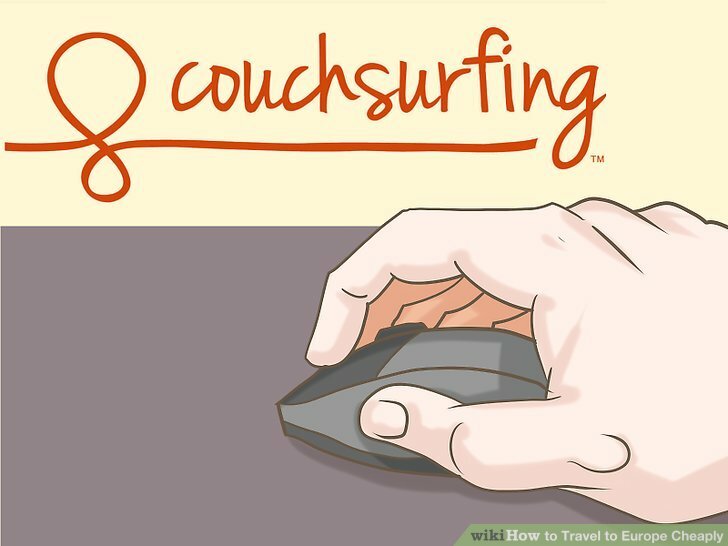 Websites like CouchSurfing list homeowners that are willing to let travelers stay on a couch or in a spare bedroom for little or no cost. Reach out to the homeowner online and start talking about your trip to see if you could stay. When you arrive, make sure to be friendly and hold conversations with the owner so you can get to know what local life is like in the city. Couchsurfing doesn’t work well if you’re traveling with a large group or if you want privacy. 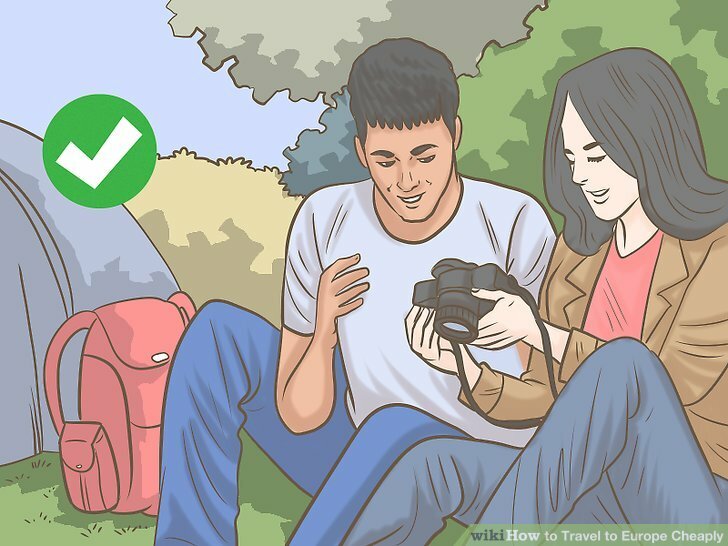 Try camping if you want to stay in an outdoor area. Even if you’re visiting a larger city, you can find a campsite to stay at overnight. Many of the camping areas have bathrooms and cooking areas that you can use while you’re there. Check online for campgrounds to see if there are any sites available near your planned destination. 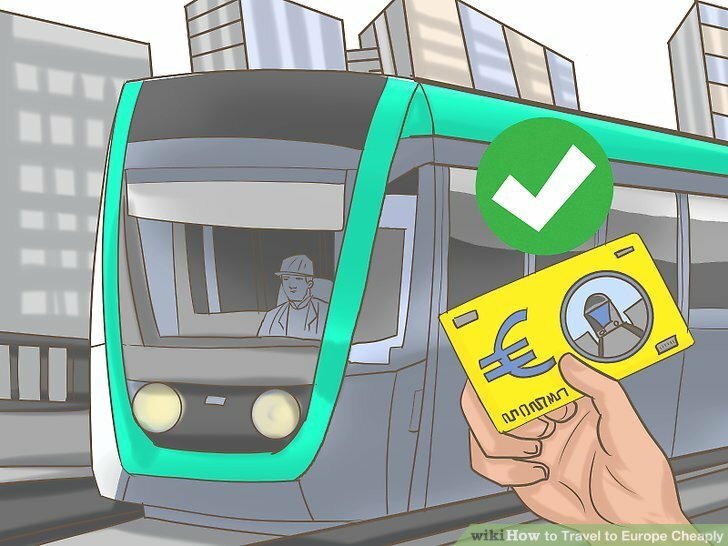 Get a rail pass to travel between locations in Europe easily. The train is one of the fastest ways to get from place to place in Europe. Look for an unlimited rail pass so you can travel by train as much as you want and arrive at destinations quickly. Many trains come with wi-fi, food and drink, and charging stations for electronics. Major cities may have their own metro and subway systems that require a different ticket than the main European railways. You can usually buy 3-day or 7-day passes for local metros if you plan on staying in the city more than 1 night. 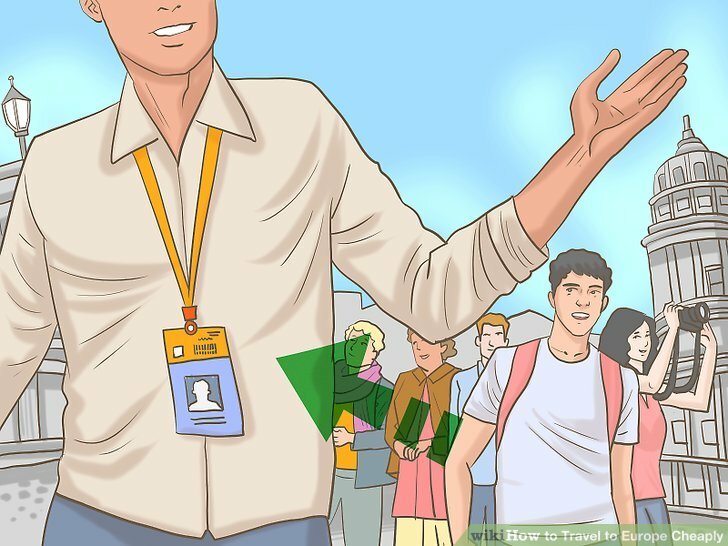 Buy tourist passes for public transportation if they’re available. Some cities offer packages just for tourists that give you free public transportation within city limits as well as admittance to many attractions there. Locate the tourist center in the city you’re visiting if it has one, and see what’s available for you. For example, a pass in Berlin gets you free entry to over 60 attractions, sightseeing tours, and a card for unlimited travel. Try flying on budget airlines between major cities to travel quickly. Companies like EasyJet and RyanAir offer cheap continental flights between cities in Europe. After booking your main flight to Europe, look for other connecting flights to cities you want to visit. Many of the flights are around $20-30 USD, but may be more expensive depending on how far you fly. Walk as much as you can to travel around a city for free. If you don’t want to spend much money to get around, try walking around the city to immerse yourself in the culture even more. Explore the city you’re visiting on foot to find places you might not have seen from a car. Take the time to stop and relax throughout the day in a park or public area. Make sure to pack comfortable shoes so your feet don’t hurt after a long day. Bring an empty water bottle with you to fill up in sinks or public fountains. Pick a few must-see spots to plan a budget for them. If there are a few locations that you know you want to visit, make room in your budget to go. Choose 1-2 things you know you want to do and schedule them to make the most of your time. Look up admission prices online so you know how much to set aside during your visit. Check websites like Groupon to see if there are any deals you can get on the attractions you want to see. 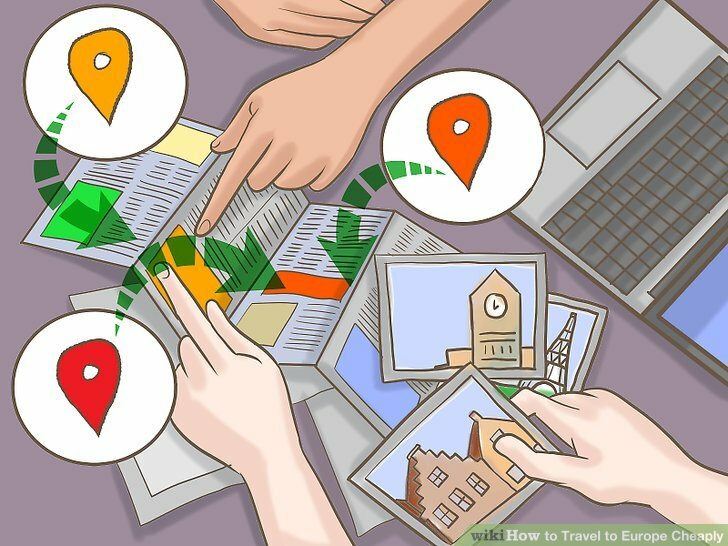 Search for how far your accommodations are from your must-see places and include traveling there in your budget if needed. Take advantage of free walking tours to see the city you’re visiting. Many cities have tours guides that will show you the main areas of the city. Follow the tour guide and listen to learn history and important information about your location. As you go on the tour, you can choose to leave at any time if you lose interest. Many walking tour guides only get paid in tips, so make sure to give them some money if you enjoyed the tour. Get food from restaurants away from tourist sites to save money. Watch where locals are eating and go to those vendors or restaurants instead of touristy locations in the city. 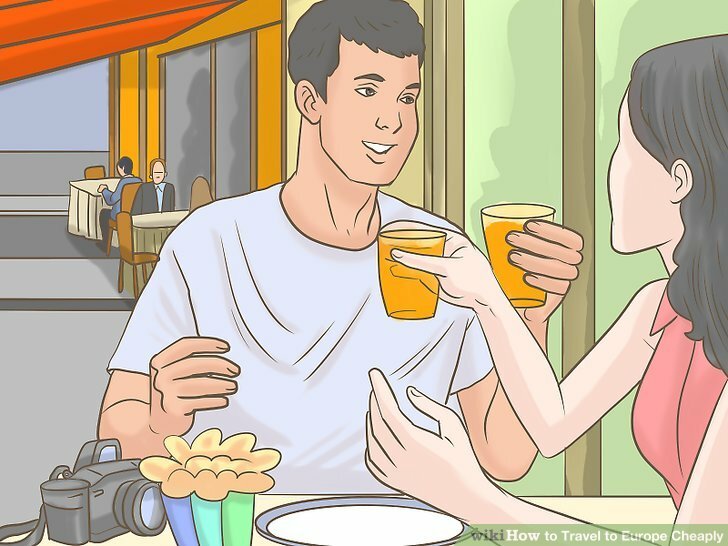 Travel a few blocks away from main tourist areas to find restaurants in your budget. Many times, you’ll find food that’s cheaper and more authentic to the region. If your accommodations have a cooking area, buy groceries and cook for a meal or two each day to save more money. Visit street vendors to try new foods without spending money on a full meal. 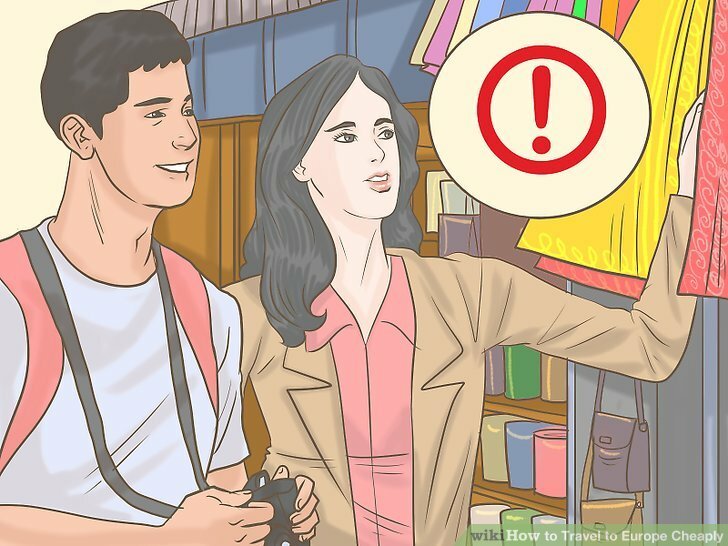 Avoid buying souvenirs if you don’t need them. Souvenirs can get pricey and they can take up a lot of room in your luggage. If you see something you want, ask yourself if it’s something that you need and can’t purchase anywhere else. Instead of buying the souvenir, take pictures to capture experiences that you’ll remember more than a keepsake. If the souvenir is something that you must have, then purchase it. Just make sure it’s easy to transport. Make sure your passport is current before you start planning your vacation since it could take up to 8 weeks for you to receive it. Check reviews for hostels and home locations online before booking them to make sure they are legitimate and trustworthy.